Now that I've done 4 cookies that are traditional for my family to have at Christmas, it's time to move on the the cookies from Matt's family. These Chocolate Covered Cherry Cookies are a favorite of Matt's (I've noticed he has a thing for chocolate cookies). His Mom sent us the recipe for these a couple years ago & I'm not sure where it comes from originally. To me these cookies are taste like rich little brownie bites topped with cherry & frosting, nothing wrong with that at all! I used Hershey's Special Dark Cocoa to make the cookie portion of these. This wonderful cocoa is 100% cacao giving my baked goods a intense dark color & chocolate flavor. I think I'd find it hard to go back to using regular cocoa after using this. Mix the flour, cocoa, baking soda, baking powder & salt together, set aside. In a mixer beat the butter until softened. Add the sugar to the butter & beat until light & fluffy. Beat in the egg and vanilla. Add the flour mixture & beat until well mixed. Roll the dough into 1-inch balls & place them 2 inches apart on an ungreased cookie sheets. Use your thumb to make an indentation in the center of each cookie. Drain the cherries reserving the juice. Remove the stems & cut the cherries in half. Place 1/2 of a cherry into the indentation in each cookie. Put the chocolate chips & condensed milk in a small saucepan. Stir over low heat until the chocolate is melted. Stir in 4 teaspoons of the cherry juice. Spoon 1/2 - 1 teaspoon of chocolate over the top of each cherry covering it completely. If the chocolate is too thick add a little more cherry juice. Bake for 10 minutes & cool on a rack. These cookies will freeze well. Individually freeze them on a cookie sheet. Once frozen place them in a box with wax paper between layers then back into the freezer. 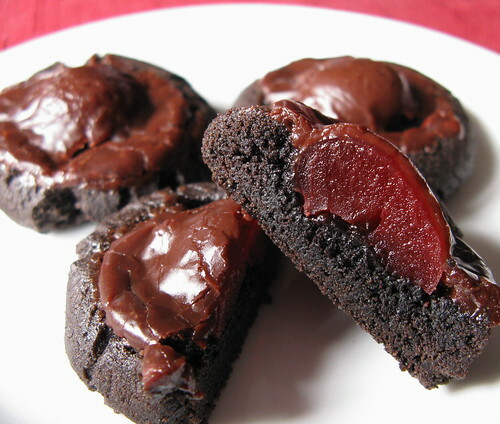 Like you said, these are very Brownie Like with a cherry on top! The condensed milk probably makes them even richer! Stay away from me with these yummy cookies!!!!!! These are the same ones I make. I just love these! I think I am going to make them for my cookie swap. They're from the better homes and gardens cookbook. I make the same ones too! They're a bit hit! Cherry and chocolate go real well together...wonderful paired with Port. If I could work in condensed milk in savory dishes...I would! Chocolate and cherry is a match made in heaven! I don't know what you mean by "leftover" condensed milk. I have never had leftovers when I open a can of condensed milk! Ooooh, I think I've found my new favorite food blog!! Lovely! You mention that these freeze well. Do you freeze before or after baking? Anonymous - You freeze them after baking them. I am not a big fan of the cherry and chocolate combo.They do look good though. Now give me raspberry and chocolate and that is a whole other story. I have something for tomorrow that is similar in the idea of these. Phew...I don't have all the ingredients - can you just imagine the damage I could do with these cookies....oh gosh. I love that dark color! I think I could eat the whole batch of these myself. this is like the cookie version of chocolate covered cherry cordials-my favorite! can't wait to see what other treats you bake up! can i use real cherries? Love the red on dark brown contrast. Cherries and chocolate always taste delicious together. Perfect! This is the new and different cookie I need to make this year. Thanks! It's not *hard* to go back to plain cocoa after using the special dark cocoa. It's impossible. I never use anything else! I was wondering if I could substitute something for the condensed milk. I want to make these for someone who is on a lactose-free diet. I was getting ready to make these and noticed the directions say to mix the sugar and cream, yet I didn't see cream in the ingredients. Is there cream and if so, how much? My thought is watering just at the thought of making these! Tricia - Cream is a verb there meaning to beat, sorry about the confusion i can see how that could happen. I've fixed it so no one else has the same problem. These cookies are a big hit at my house. I like them chilled. They last a long time in the fridge and they do freeze well. I freeze them either the way stated here or in baggies. They seem to taste better after sitting in fridge a day or 2. Thanks for posting.